Women rarely have the same dramatic symptoms that men have … you know, the sudden stabbing pain in the chest, the cold sweat, grabbing the chest & dropping to the floor that we see in movies. 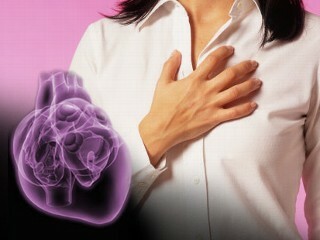 Here is the story of one woman’s experience with a heart attack. I had a heart attack at about 10:30 PM with NO prior exertion, NO prior emotional trauma that one would suspect might have brought it on. I was sitting all snugly & warm on a cold evening, with my purring cat in my lap, reading an interesting story my friend had sent me, and actually thinking, ‘A-A-h, this is the life, all cozy and warm in my soft, cushy Lazy Boy with my feet propped up. A moment later, I felt that awful sensation of indigestion, when you’ve been in a hurry and grabbed a bite of sandwich and washed it down with a dash of water, and that hurried bite seems to feel like you’ve swallowed a golf ball going down the esophagus in slow motion and it is most uncomfortable. You realize you shouldn’t have gulped it down so fast and needed to chew it more thoroughly and this time drink a glass of water to hasten its progress down to the stomach. This was my initial sensation–the only trouble was that I hadn’t taken a bite of anything since about 5:00 p.m. This fascinating process continued on into my throat and branched out into both jaws. ‘AHA!! NOW I stopped puzzling about what was happening — we all have read and/or heard about pain in the jaws being one of the signals of an MI happening, haven’t we? I said aloud to myself and the cat, Dear God, I think I’m having a heart attack! I lowered the foot rest dumping the cat from my lap, started to take a step and fell on the floor instead. I thought to myself, If this is a heart attack, I shouldn’t be walking into the next room where the phone is or anywhere else… but, on the other hand, if I don’t, nobody will know that I need help, and if I wait any longer I may not be able to get up in a moment. I pulled myself up with the arms of the chair, walked slowly into the next room and dialed the Paramedics… I told her I thought I was having a heart attack due to the pressure building under the sternum and radiating into my jaws. I didn’t feel hysterical or afraid, just stating the facts. She said she was sending the Paramedics over immediately, asked if the front door was near to me, and if so, to un-bolt the door and then lie down on the floor where they could see me when they came in. I unlocked the door and then laid down on the floor as instructed and lost consciousness, as I don’t remember the medics coming in, their examination, lifting me onto a gurney or getting me into their ambulance, or hearing the call they made to St. Jude ER on the way, but I did briefly awaken when we arrived and saw that the radiologist was already there in his surgical blues and cap, helping the medics pull my stretcher out of the ambulance. He was bending over me asking questions (probably something like ‘Have you taken any medications?’) but I couldn’t make my mind interpret what he was saying, or form an answer, and nodded off again, not waking up until the Cardiologist and partner had already threaded the teeny angiogram balloon up my femoral artery into the aorta and into my heart where they installed 2 side by side stints to hold open my right coronary artery. I know it sounds like all my thinking and actions at home must have taken at least 20-30 minutesbefore calling the paramedics, but actually it took perhaps 4-5 minutes before the call, and both the fire station and St Jude are only minutes away from my home, and my Cardiologist was already to go to the OR in his scrubs and get going on restarting my heart (which had stopped somewhere between my arrival and the procedure) and installing the stents. Why have I written all of this to you with so much detail? Because I want all of you who are so important in my life to know what I learned first hand. 1. Be aware that something very different is happening in your body, not the usual men’s symptoms but inexplicable things happening (until my sternum and jaws got into the act). It is said that many more women than men die of their first (and last) MI because they didn’t know they were having one and commonly mistake it as indigestion, take some Maalox or other anti-heartburn preparation and go to bed, hoping they’ll feel better in the morning when they wake up… which doesn’t happen. 2. Note that I said ‘Call the Paramedics.’ And if you can take an aspirin. Ladies, TIME IS OF THE ESSENCE! Do NOT try to drive yourself to the ER– you are a hazard to others on the road. Do NOT have your panicked husbandwho will be speeding and looking anxiously at what’s happening with you instead of the road. Do NOT call your doctor —he doesn’t know where you live and if it’s at night you won’t reach him anyway, and if it’s daytime, his assistants (or answering service) will tell you to call the Paramedics. He doesn’t carry the equipment in his car that you need to be saved! The Paramedics do, principally OXYGEN that you need ASAP. Your Dr. will be notified later. 3. Don’t assume it couldn’t be a heart attack because you have a normal cholesterol count. Research has discovered that a cholesterol elevated reading is rarely the cause of an MI (unless it’s unbelievably high and/or accompanied by high blood pressure). MIs are usually caused by long-term stress and inflammation in the body, which dumps all sorts of deadly hormones into your system to sludge things up in there. Pain in the jaw can wake you from a sound sleep. Let’s be careful and be aware. The more we know the better chance we could survive. A cardiologist says if everyone who gets this mail sends it to 10 people, you can be sure that we’ll save at least one life. If you have high levels of the chemical bisphenol-A (BPA) in your urine, you may be at an increased risk of heart disease, according to new data from a long-running British health survey. People who developed heart disease also tended to have higher urinary concentrations of BPA, a somber finding that, while not proof that BPA causes heart disease, raises serious questions about why the chemical is still being so widely used across the globe. Does BPA Exposure Cause Heart Disease? Much of the research on BPA — the ubiquitous toxic chemical used in plastics, canned goods, dental sealants, paper money and more — has involved animals, leading skeptics (usually those in the chemical industry) to say the effects may not necessarily be the same in humans. Well this latest study involved humans, and the results still indicated that exposure to BPA may be correlated with an increased risk of heart disease. BPA is so pervasive that scientists have found that 95 percent of people tested have potentially dangerous levels of BPA in their bodies … and heart disease continues to be the leading cause of death in the United States. BPA is clearly not the only factor involved in heart disease, but given its widespread use – and the fact that it is even commonly found in the umbilical cords of babies in utero — any negative impact it makes on human health could prove disastrous. BPA is an endocrine disrupter, which means it mimics or interferes with your body’s hormones and “disrupts” your endocrine system. The glands of your endocrine system and the hormones they release are instrumental in regulating mood, growth and development, tissue function, metabolism, as well as sexual function and reproductive processes. For instance, research has found that “higher BPA exposure is associated with general and central obesity in the general adult population of the United States,” while another study found that BPA is associated not only with generalized and abdominal obesity, but also with insulin resistance, which is an underlying factor in many chronic diseases. 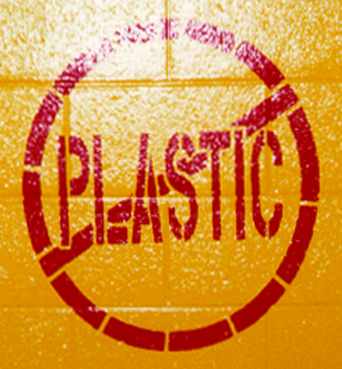 Many people have stopped carrying plastic water bottles and using plastic utensils and food containers in order to avoid BPA. As public knowledge of BPA in plastics has grown, a slew of BPA-free plastics have also hit the market, making it easier to choose products that do not contain this toxin. However, wise as it may be to limit your use of plastic products, this will not be enough to protect you from BPA’s dangerous effects. BPA is found in the lining of nearly all canned foods and beverages, and it turns out this source of exposure could be increasing your BPA levels alarmingly. In one study, eating canned soup for five days increased study participants’ urinary concentrations of BPA by more than 1,000% compared to eating freshly made soup. 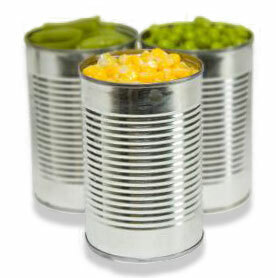 The researchers believe canned goods may be an even more concerning source of exposure to BPA than plastics, and if the above finding that increased urinary levels of BPA are linked to heart disease are confirmed, it’s logical to assume that eating canned goods could increase your risk of heart disease significantly because of the exposure to BPA! As one of the world’s highest production volume chemicals, BPA is incredibly common in food and drinks packaging, as well as in other places you probably wouldn’t expect, like receipts. A study in Analytical and Bioanalytical Chemistry found that of 13 thermal printing papers (the type often used for receipts) analyzed, 11 contained BPA.Holding the paper for just 5 seconds was enough to transfer BPA onto a person’s skin, and the amount of BPA transferred increased by about 10 times if the fingers were wet or greasy. Handling paper currency is another likely route of exposure, as in a study published in Environmental Science and Technology, researchers analyzed paper currencies from 21 countries for the presence of BPA, and the chemical was detected in every sample.They also measured the transfer of BPA from thermal receipt paper to currency by placing the two together in a wallet for 24 hours. This dramatically increased the concentrations of BPA on the money, which again suggests that receipts are highly contaminated. Is it Possible to Avoid Having Your Health Damaged by BPA? BPA is all around us, that’s true, but steps are slowly being made to phase out its use. BPA has been banned in baby bottles in Europe and the United States, for instance, and in response to consumer demand, some companies are also following suit. It’s important to make an effort to support the companies that have already removed BPA from their products, or those that offer products that never contained it (such as baby toys made from natural fabrics instead of plastic). If enough people refuse to buy BPA-containing goods, companies will have no choice but to get this toxin out of their products. One final tip: certain “friendly bacteria” have the ability to break down BPA, as well as reduce your intestinal absorption of it. So one way to help protect yourself from the adverse effects of inevitable BPA exposure is by eating traditionally fermented foods, such as raw grass-fed organic kefir, organic fermented veggies, like sauerkraut or Kimchi, or taking a high-quality probiotic supplement. The benefits of the berry are starting to seem endless. Blueberries have been shown to be helpful with protecting blood vessels in diabetics. 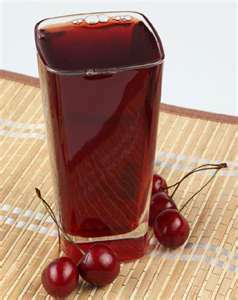 Cranberries have been used for years to effectively treat urinary tract infections. And raspberries have eye-protective antioxidants called lutein. Eating berries in general may also help ward off certain types of cancers. Berries are an amazing group of fruits. The berry came up with an amazing assortment of plant chemicals called polyphenols, which are powerful antioxidants, to help neutralize the sun’s radiation to avoid damage to its tender flesh. A type of polyphenol called flavonoids give berries their dark coloring and confer health benefits on uswhen we eat them. One of new berries on the block that science is seriously looking into is the lingonberry; it appears to have higher concentrations of plant polyphenols and may confer even greater health benefits. 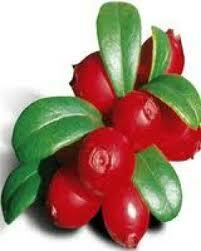 Well known in Scandinavia, the lingonberry’s Latin name is vaccinium vitis-idaea, and is also known as the cowberry. As a member of the vaccinium species, it is related to the cranberry, bilberry and blueberry. Today, scientists are showing its value in both human and animal studies that are proving to have positive results. Animal studies have shown how the lingonberry can lower inflammatory molecules, block oxidants from destroying tissue, and also help the body replace important antioxidants, like glutathione, which is a master antioxidant in our body. A 2010 Canadian study with First Nation Cree subjects found that the lingonberry was able to reduce the effect of advanced glycation end-products (AGEs). AGEs are the byproduct of sugars and heated protein molecules in the body that accumulate in patients with high blood sugar. These AGEs contribute to the damage in a diabetic’s vessels. This damage is a major contributor to kidney disease, eye disease and circulation problems that can lead to skin sores and amputation. Naturopathic treatments for diabetes include exercise, eating low glycemic index foods (low sugar content) that are cooked at low temperatures and are minimally processed, and blood-sugar-balancing herbs like gymnema and cinnamon. Now, it seems we can add lingonberry to this list. Although not well known in the United States, lingonberries are available in juice form in some health food stores. They can also be found in jams, and the berries can be bought frozen or in powdered form online. Those with diabetes, blood pressure challenges, and inflammatory concerns, here is a quick recipe (make sure to consult with your physician first) a tablespoon or two of the frozen berries and adding them to one cup of non-sweetened almond milk with a three-quarter cup of ice; blend for a healthy flavonoid-rich treat!